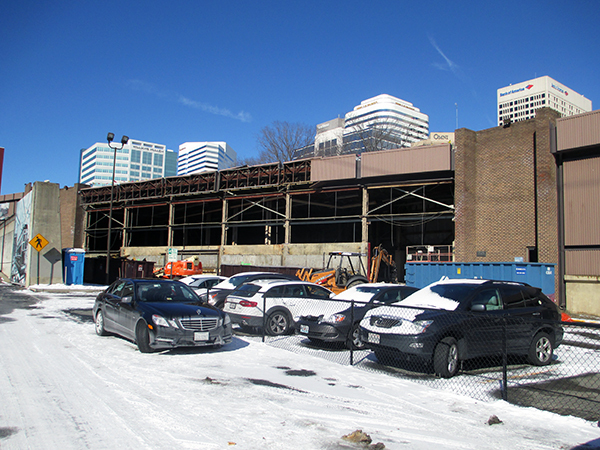 A major downtown development is rolling into its next construction phase. Fountainhead Development and WVS Companies are clearing the way for a fifth apartment building at the Locks, a more than $40 million mixed-use development on the Haxall Canal at the former Reynolds North plant. The project, whose working title is Locks Building 5, is the first new construction job at the seven-acre complex that includes 174 apartments and the Casa Del Barco restaurant. The Italinate building houses apartments and the Casa Del Barco restaurant. Locks Building 5 will replace part of an L-shaped warehouse just east of the corner of 12th and Byrd streets. Papa estimated that construction would cost about $11 million, bringing WVS and Fountainhead’s total investment in the Locks to almost $45 million. The team bought the former metals plant in February 2012. All of its finished apartments are occupied, which WVS vice president Richard Souter said drove the team to get to work on 52 more units at Locks 5. WVS and Fountainhead hope to finish the building this year. Walter Parks is the architect, and KBS is the general contractor. BB&T is providing financing. Apartments at the Locks rent for between $1,200 and $1,800. Papa said that the team hasn’t nailed down final rent numbers for its latest apartment building but that prices would be commensurate with the going rate for higher-end units in the area. Locks 5 will also have less variability among its units than the other buildings at the complex, Souter said, because the developers don’t have to work around the layout of an existing building. The first residents moved into the rehabbed Locks buildings last January. The area also welcomed an F.W. Sullivan’s restaurant across the canal from the Locks on the ground floor of the Troutman Sanders building. More demolition is the up next for development at the Locks. Papa said the team plans to “liberate the canal” by removing a larger section of the Locks 5 warehouse that spans the waterway. Fountainhead and WVS will also eventually convey to the city the portion of the canal that cuts through the Locks, paving the way for a cooperative development effort laid out in the Richmond Riverfront Plan. The Locks also has the potential to add to the downtown skyline: Plans call for a tower structure to take the place of a warehouse at 10th and Byrd streets, immediately east of Riverfront Plaza. The warehouse is currently used for parking, and Souter said a use for a potential tower has not been determined.